Crete is the largest of the Greek islands and the fifth largest island in the Mediterranean Sea at 8,336 km2. Crete is one of the 13 peripheries of Greece and covers the same area as the Greek region of Crete from before the 1987 administrative reform. 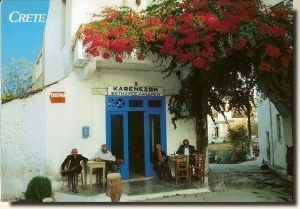 It forms a significant part of the economy and cultural heritage of Greece; while it retains its own local cultural traits (such as its own music and dialect), Cretans identify themselves as Greeks. Heraklion is the largest city and capital of Crete. Crete was the centre of the Minoan civilization, the oldest Greek civilization. The island is the location of significant ancient history, which provides popular modern day tourist destinations. They include the Minoan sites of Knossos and Phaistos, the classical site of Gortys, the Venetian old city and port of Chania, the Venetian castle at Rethymno and the Samaria Gorge. The Nikos Kazantzakis International Airport is located just outside Heraklion.